Fiberglass receptacles are built to last. 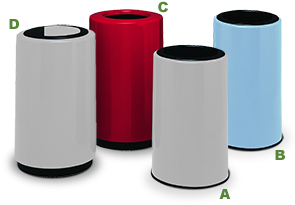 These one-piece waste receptacles are highly attractive, smooth and durable. The unique open top and push door designs provide adequate space for proper trash disposal. Servicing and cleaning the unit is easy, simply lift off the one piece receptacle to access the included liner. A supportive recessed base and trim protects floors and the receptacle from damages. 16 and 21 gallon units with pitch-in top or push door lids are available. The fiberglass material will not corrode, rust, stain or tarnish. They are also highly sanitary and secure, featuring no exposed seams, welds or crevices to harbor dirt and bacteria. These receptacles are skillfully constructed for indoor and outdoor use and work especially well in cafeterias, entrance ways, casinos and even seaside.